Can video games help improve your vision? Pay a visit to your local vision therapist's office and you're likely to see several of the patients playing video games. Although you might assume that they're taking a little break, video games may actually be part of their therapy. There's definitely something addictive about video games. Whether you're matching colored candies, popping balloons, or launching angry birds at pigs, advancing to the next level or beating your previous high score can become an obsession. Vision therapists take advantage of their patients' natural interest in video games by incorporating them into therapy plans. No matter how motivated the patient, performing the same old therapeutic activities can become a little boring after a while. Special video games designed to improve vision and enhance the pathways between the brain and the eyes make therapy fun and may even help some patients progress more rapidly. How Do Video Games Help? 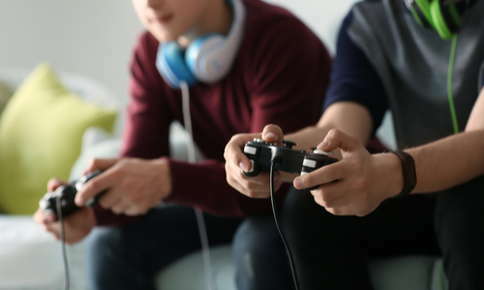 Vision therapists use a variety of video games to improve useful vision, including virtual reality games for people who have convergence insufficiency, strabismus, or amblyopia. Convergence insufficiency occurs when your eyes don't work together as a team. It can cause headaches, eyestrain, or blurred or double vision. You may also notice that you lose your place easily or have difficulty concentrating. Strabismus, commonly called crossed eyes, happens if your eyes aren't properly aligned. If the condition isn't corrected with vision therapy or surgery, in some cases, you may eventually develop ambylopia, or lazy eye. If you have ambylopia, your brain ignores the light impulses it receives from one eye, which can cause blurred vision and trouble with depth perception. When amblyopia patients play specially designed video games, both eyes see the same image through their virtual reality goggles with one important difference; the signal strength of the image the good eye sees has been decreased. The difference in signal strength forces the bad eye to work harder. Over time, the bad eye begins to grow stronger. Several studies have demonstrated the effectiveness of video games in vision therapy, including one published in the Journal of Vision. Study participants included children ages 7 to 13 who had amblyopia. After playing just 10 hours of an action video game, their ability to see images clearly in the bad eye improved by 28 percent. Improvement has been just as impressive in other studies performed with adult participants. Video games can also help improve several other problems that affect usable vision, such as visual memory and peripheral awareness. If you have poor visual memory, you may struggle to copy images, spell words correctly, or remember what you've just read. Video matching games can be helpful in improving visual memory. During the games, players reveal one tile and then must click on other tiles to reveal the matching image. Peripheral awareness problems may also improve after video game therapy. If you have poor awareness of objects and movements at the edge of your visual field, you may have difficulty playing sports or may trip and fall because you don't notice obstacles. Video games can help you fine-tune your peripheral vision. One game requires you to stare straight at a screen while numbers appear around the edges of the screen. After the numbers disappear, you'll be asked to click on the numbers you saw. With practice, you'll slowly begin to recognize more and more numbers in your peripheral vision. Video games are just one of the tools and techniques vision therapists use to help you make the most of your vision. If you think that you or a family member could benefit from vision therapy, contact us to schedule a comprehensive eye exam. NJIT Magazine: Can Eye Therapy Be Fun? Can Vision Therapy Help Improve Your Reading Abilities? Do Genetics Play a Role in my Child's Vision? "I can’t say enough great things about Elemental Eyecare. Dr. Gabby was so amazing with our special needs daughter. Highly recommend!!" "Both of my kids loved Dr Gabby. They have been seeing another doctor for over 12 years, but the transition to Elemental Eyecare was super easy. My son had a sudden change in his vision and they got us in within days. We are so happy we do not have to drive to Eugene anymore to see a pediatric specialist." "My six year old recently had an appointment with Dr. Marshall! She was amazing and so great with children! The office was really nice and very clean and there were toys and stuff for my toddler to do while we wait! Overall great experience and wonderful staff!"